Turnitin is an Internet-based plagiarism-prevention service that checks the submissions made by learners for unoriginal content. 1. Click the global Add (+). You can add a post from anywhere on any page by just clicking '+' at the top-right corner of the page. 3. Tick Enable Turnitin under Submission. 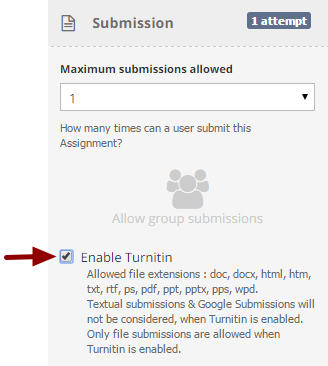 Note: In an assignment with Turnitin enabled, only file submissions are allowed. 4. Click Publish on [Date, Time]. 5. A confirmation message appears. Note 1: Turnitin Integration can be enabled only for assignments and NOT for online quizzes. Note 2: Turnitin integration will not work for any files picked from Google drive. Only files uploaded directly from the user's computer can be used for Turnitin plagiarism check. Turnitin is unable to check images at present and compare the learner's submission with its available resources to generate the originality report. Turnitin also recommends to upload PDF documents which contain text. PDF files containing images of text will be rejected.